Feeling sensations of spinning, nausea, and imbalance are not as rare as you might think. In fact, it is quite common. As many as 35% of adults aged 40 years or older in the United States—approximately 69 million Americans—have experienced some form of vestibular dysfunction. 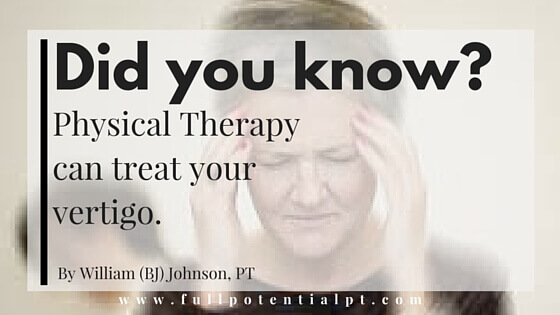 What most people don’t know is that physical therapy can treat vertigo. BPPV is a condition of the inner ear that can cause symptoms of dizziness, unsteadiness, spinning, nausea difficulty with concentration and visual focusing. Before going any further, I want you to understand what this condition really means. Benign means that it is not harmful to you. Paroxysmal means that it comes in sudden, brief spells. Positional is the certain head and neck positioning that causes the pain. Vertigo is a false sense of rotation. The reason you get dizzy with this condition is because there is a miscommunication between what your inner ear is perceiving and what the rest of your body is perceiving. Small canals in your inner ear tell your brain what position you are in. For example, they let you know if you are standing up, lying down, or turning in a direction. With BPPV, a crystal gets dislodged and affects how the canals tell you your position. Our head is upright but the canal/inner ear thinks we are lying down. This conflict or confusion creates the dizziness or unsteadiness perceived as we move or change positions. There are several things that can contribute to BPPV. Head trauma or whiplash injuries, inner ear disease, osteoporosis, type 1 diabetes, sleeping positions, prolonged immobility on one side or the other. It may feel like it is completely out of the blue. You can come to Full Potential to have a screening. During the screening, we can determine if the symptoms are truely BPPV (inner ear crystal out of position) or if there are other sources of the symptoms. When treated properly with physical therapy, BPPV only takes a few visits for it to be treated. No matter what, a patient should be evaluated by a health care provider because there can be other causes of these symptoms related to other serious medical conditions. Yes. BPPV can be treated with re-positioning maneuvers that help guide the inner ear crystal back into the correct position. Usually, there is a noticeable difference right away and resolution with a few treatments. Physical therapy can also address the muscular tension related to this and vestibular or balance retraining that may be beneficial. If you think you may have BPPV, call us for a free screening today. Physical therapy is highly effective in treating vertigo and can help you with only one visit. Call Full Potential Physical Therapy Today!